Take as many tomatoes as you have dining companions, cut off (but don’t discard) the tops. Scoop out the insides of the tomatoes and chop them up, making sure you don’t lose the juices. Mix the chopped up insides with some rice, which you will have parboiled until they are about half-tender. Season the rice mixture with salt, pepper, a drizzle of olive oil, just a bit of finely minced garlic and some minced herbs, typically oregano, basil and/or parsley. Spoon the seasoned rice mixture into the insides of the tomatoes, taking care not to pack them too tightly, and place their tops back on top of the rice stuffing. Place them in a well-oiled baking pan and scatter some wedges of potato around the tomatoes. Season the dish with salt and pepper and, if you like, a sprinkling of oregano. Drizzle everything with some more olive oil. Roast in a hot oven (200C, 400F) for about 45 minutes, or until the rice and potatoes are fully cooked, the tomatoes nicely roasted—they will crinkle up and their edges will char a bit. Check on the dish from time to time while it is roasting. If it seems dry, drizzle over a bit more oil. You can also move the potatoes around so they cook evenly and are well coated with the oil. The dish is usually left to cool and eaten at room temperature or just slightly warm. In Rome at least, Baked Tomatoes with Rice are invariably served with potatoes but if this is too much carb for your taste, you can omit them. Some recipes call for reserving a bit of the tomato pulp and mixing it with the potatoes so they too get some tomato flavor and a bit of color.You can also play with the rice stuffing. As indicated, the herbs can vary with your taste. Some recipes omit the garlic, others call for some grated pecorino or parmigiano. Some add capers, olives and/or chopped anchovy, although these ingredients would change the character of the dish pretty radically and, in my humble opinion, upset the balance of flavors. Needless to say, the success of this simple dish will depend on the quality of its ingredients, especially the tomatoes. This is really something you should save for the best, tastiest summer tomatoes you can find. The tomatoes themselves should be large enough to stuff, of course, but should not be gigantic, either, or you will wind up with too much stuffing, making for a rather stodgy dish. The tomatoes should be fully ripe, but not at all mushy, or they will disintegrate in the roasting process.As far as the rice is concerned, the typical rice would be short-grained, but this is a forgiving recipe. You can even use leftover Chinese take-away, which is what I used tonight! A few Greek followers tweeted me recently to say that they have the same dish, called Gemista, often made from other veggies, too, like zucchini, eggplant, peppers and so on. You learn something new every day! Take as many tomatoes as you have dining companions, cut off (but don't discard) the tops. Scoop out the insides of the tomatoes and chop them up, making sure you don't lose the juices. Mix the chopped up insides with some rice, which you will have parboiled until they are about half-tender. Season the rice mixture with salt, pepper, a drizzle of olive oil, just a bit of finely minced garlic and some minced herbs, typically oregano, basil and/or parsley. 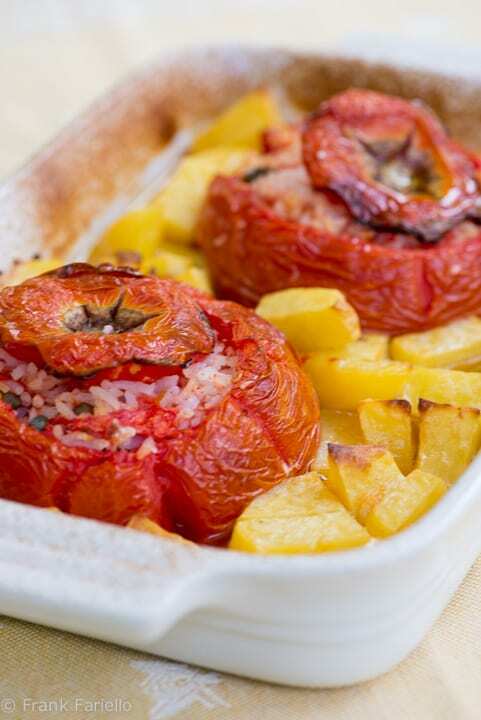 Baked Tomatoes with Rice are usually left to cool and eaten at room temperature or just slightly warm. Do you know that now in Italy exist some restaurants with only rice (riso) dishes? Wonderful dish, love that you used the tomato tops:) Looks fantastic! Wow Frank this is a fantastic recipe! I love tomatoes and these are making my mouth water. Potatoes on the side sounds perfect to me. Many thanks, folks, for all the lovely comments. Buon appetito! I ate this “pomodoro” years ago and I was stoned by its taste….simple divine ! basil is the balance from the recipe ! I'll cook it soon ! Great recipe and post, and I really love those dishes! Actually serving these with potatoes seems completely appropriate- get a balance on the acid in the tomato. Plus, I am unafraid of carbs, potatoes in particular! What a wonderful way to use tomatoes, which happen to be my favorite veggie. So much room to play with this, very nice Frank! What a novel way to use sweet summer tomatoes. I love the simplicity of the flavors in this recipe. Too many carbs? I'm sorry … is there such a thing? This i perfection for this time of year. Love it! This is perfect for a lazy dinner night. Thank you! Beautiful doesn't even begin to encompass how wonderful that dish is. I'm suddenly really excited about all the tomatoes we have almost ready to pick from our garden. This looks wonderful, and I'm making this ASAP! Frank, this looks wonderful.The tomatoes looks luscious. I'm going to have to try this. This is one of my favorite ways to enjoy rice and tomatoes. I've never made them with potatoes, though, but I like it. Beautiful picture. I envy the person that has the pleasure of eating your wonderful food this is awesome, my mom made this the same way love it!